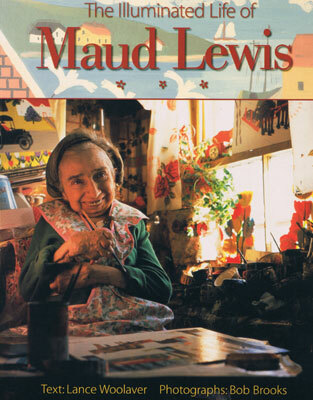 The Illuminated Life of Maud Lewis Maud Lewis (1903-1970) was..
Maud Lewis (1903-1970) was recognized and revered in her own lifetime. She offered her endearing images to the passing world through her roadside sign, “Paintings for Sale,” and was rewarded by the enthusiastic response she received from both the community and tourists as well as from art collectors. The Illuminated Life of Maud Lewis is an invitation to share once again with the world the perceptions of this celebrated Nova Scotia folk artist in prose, photographs, and reproductions of her works. This award-winning picture book of the life and work of Maud Lewis is available now at The Art Gallery of Nova Scotia and may be ordered from Nimbus Publishing, Halifax, N.S. Winner of the Dartmouth Book Award and the Atlantic Book Award. With colour reproductions of Maud’s Christmas cards and pictures, and Bob Brooks’ wonderful portraits of Maud at work and at home in Marshalltown, Digby County, Nova Scotia. Spencer Books is the publisher and distributor for the biography Maud Lewis The Heart on the Door and the play Maud Lewis World Without Shadows. Spencer Books is located at Apt. 400, 1472 Cathedral Lane, Halifax, N.S., B3H 4K8.